Collectors, dealers and restorers of these clocks know how vital it is to identify the movement fitted to an Anniversary or 400 day Clock, whether it be to classify or value it, or to be able to select the correct parts. Without the correct suspension wire or unit, the clock will probably run but will not keep the right time. Mervyn Passmore has devised a unique way to identify the manufacturer and model of these clock movements quickly and accurately, using a combination of maker's names and the back plate dimensions. Emphasis is made on mass-produced 400 day movements manufactured in the last 100 years. In 1976 he co-founded one of the world's leading distributors of clockmakers' supplies and the records he kept and the experience and knowledge he gained over the years, combined with data obtained from a large private collection of Anniversary Clocks, is now available to all. SECOND EDITION: Now with 400+ pages including 10 new chapters detailing further manufacturers plus a quick reference identification chart. Profusely illustrated with actual photos of the logos, trademarks and backplates of almost every make and model of post-war mechanical Anniversary Clock movement. 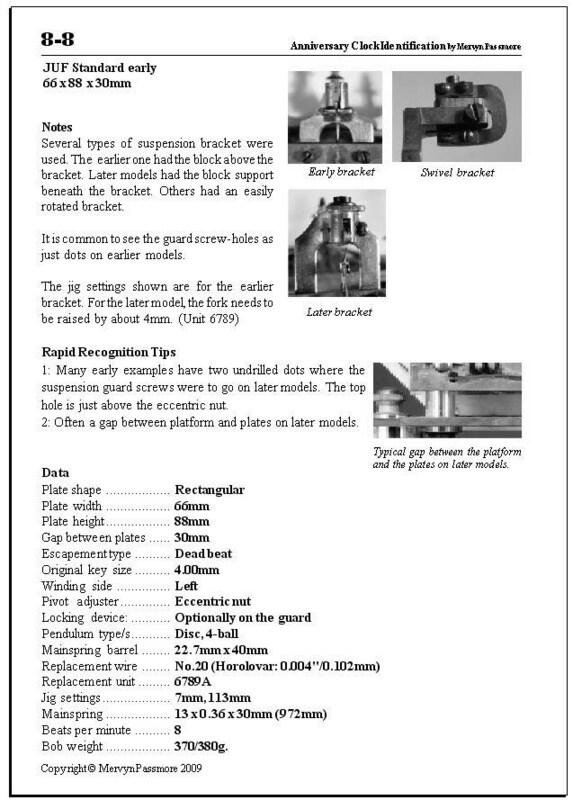 Details of the suspension thickness, replacement unit, mainspring and original key size are provided for every model listed, plus identification tips and advice. 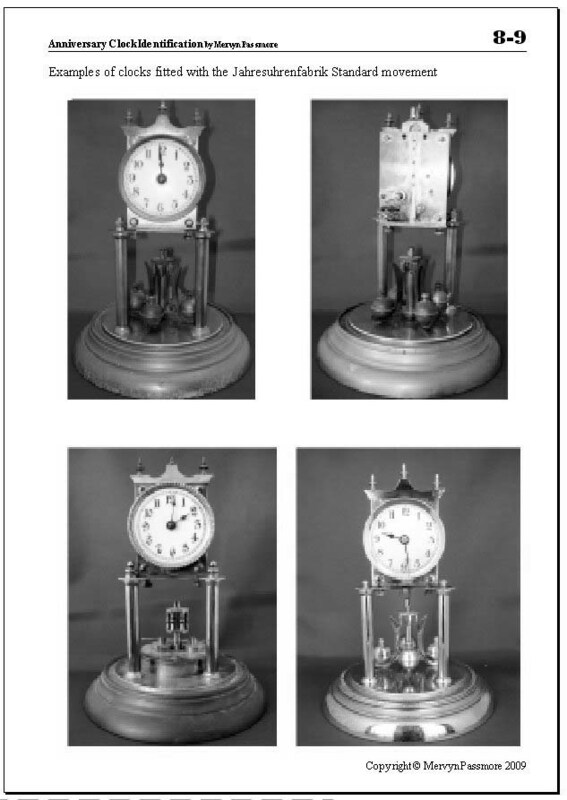 Also included is information on many of the early electro-mechanical torsion and impulse pendulum movements. One of the features of the book is the ability of readers to create a temporary page from the book describing a particular movement, and to be able to give the link to that page to a friend, customer or online discussion group. It can also be used on Ebay to describe the model being sold. The recipient of the link does not need to buy the book to read the page. 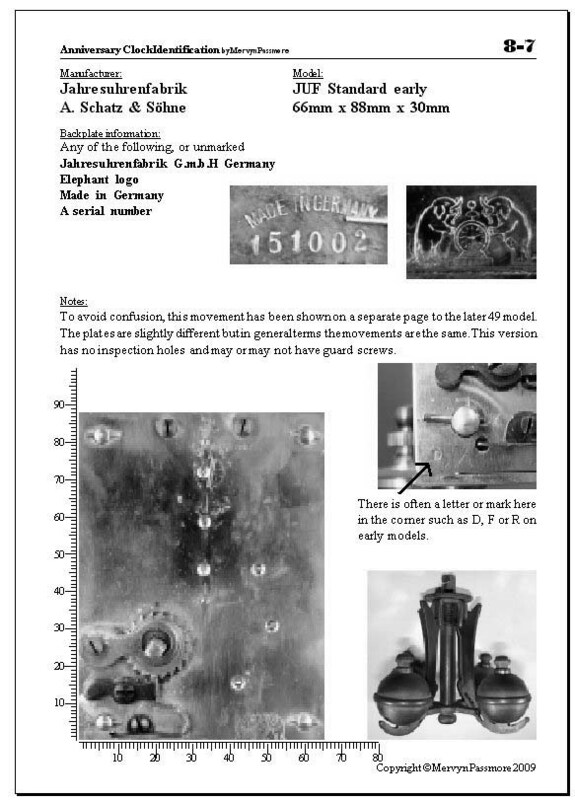 A FREE online Anniversary (Torsion) Clock Identification system, devised by the author and based on information from the book, is available free to use Here. You will need to know the width and height of the backplate. 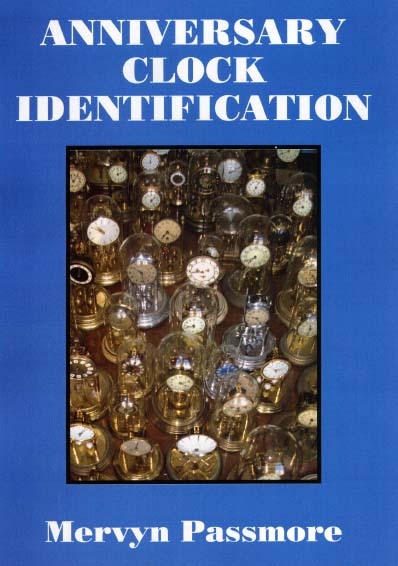 Photos and simple questions should guide you through to the identification of your clock. NEW A flowchart poster to help you identify your Anniversary (Torsion) Clock Identification, devised by the author and based on information from the book, is available free to use Here.